Yesterday I was meeting a friend and she suggested we check out the Upside down cake Moscow bakery. I felt really lucky with this finding. We spent 2.5 hours there and since then I can't help thinking about when I'm going back to try more desserts. Upside down cake bakery is located some 5 minutes walk from Belorusskaya metro station. The first thing I saw entering was their elaborate dessert vitrine. Tiny cupcakes from red velvet dream to carrot and orange. Later I found these are convenient to take away in 6 piece boxes. The menu blackboard was listing teas, coffees, hot wine and - ahh - hot chocolate with homemade marshmallow. A friendly barista noticed I was getting lost and offered advice. I asked about the bakery and he told me Upside down cake opened several month ago. It is one of new projects of Aizec Correa, after he sold the Correa's chain. The menu comes from their British pastry chef, Suki Maman. Have a look at our puddings. This one is based on vanilla custard with a lot of bananas and crispy hazelnut topping. And that's the rice pudding with peach. These are our cakes. We bake different cakes on different days, but some of them, like red velvet, are made every day as they are very demanded. The spongy milky cake we also have all the time and it is always sold out. It is soaked overnight in a special milk mixture of condensed milk and evaporated milk. Later I found it quite resembles the Tres leches cake. Then it is covered by light whipped cream. We also have another similar one, but with coffee and Kahlua. Next to the cakes I saw savory muffins and pies and that was where I needed a break. I set down with a beautiful cup of cappuccino waiting for my friend and realizing I knew literally nothing about British pastry. The space felt pretty and peaceful. Then I noticed that Aizek Correa entered the shop and had a chat with one of the barista. He got a cup of espresso and set at one of the tables. I wish I wasn't as shy and talked to him a bit. Later we got the vanilla and banana pudding. My friend seemed to know about the dessert and associated it with trifle. I generally love vanilla cream and the pudding tasted gorgeous to me. 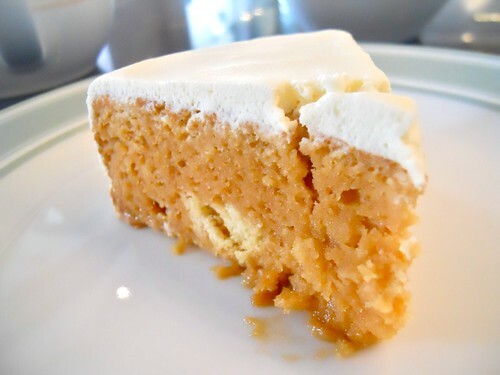 I also got the delicious spongy milk cake, which was very moist and tender with intense milky-caramel flavor. A last glance at the pineapple upside down cake and marshmallows and we left thinking we are coming back to the bakery very soon. There is so much more to try. Wow, these cakes make me salivate. Photos are great and the commentary nice. I really like to visit this place one day.